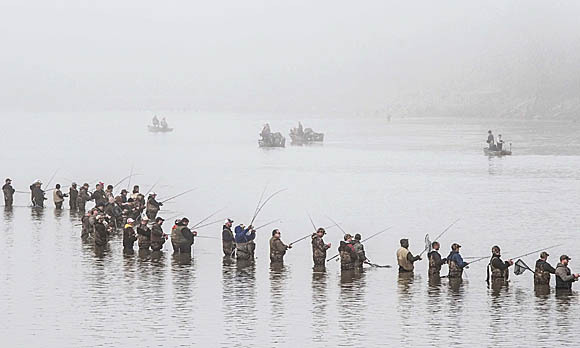 Every Spring, thousands of anglers descend on Northwest Ohio to fish the waters of the Maumee & Sandusky Rivers for a spawning run of Walleye followed by White Bass. This annual fishing tradition is beloved by many, including myself. The Sandusky River is the smaller tributary of the two, and the fishing is limited to the downtown area of Fremont, Ohio. The Maumee River, which gains far more attention and rightly so, boasts a much longer stretch of river to target the fish. The most popular Maumee River location would be Sidecut Park, followed by places like White Street Access and Jerome Road. Most people consider the water temperature hitting 40 degrees as the start of the run. Depending on the winter temperatures that can vary greatly, it is difficult to forecast dates of the run starting or ending. Water temperature is the best indicator along with flow (height). When that water temperature hits it’s mark, the anglers start to show up by the masses and the fishing pressure can be intense. Many people do not like fishing the run due to the ‘elbow to elbow’ crowded fishing conditions but I recommend not letting that discourage you. The crowds are there for a reason, the fishing is great and the experience is fun. Why not join them?! Most people get along fine and I have often made friends for the day with the folks fishing an arms length from me. It really gets blown out of proportion about people’s behavior and I honestly think that is done in an attempt to keep people away. Plain and simple don’t fall for it. Coach yourself into a good attitude about the fact that you will have anglers fish very close to you, and you’ll be fine. Also, if you have the ability to fish during the week and are willing to try locations that aren’t the popular places where fish stack up, you can get a little more room. Specific regulations are in effect for the Walleye Run each year. These special rules apply March 1 to May 1 and commonly state that fishing is restricted to sunrise to sunset only, single hooks with no more than a half inch from shank to point. Please check the ODNR website each year for the most recent applicable Walleye Run regulations. The ODNR has a strong presence at the Walleye Run, both visibly and undercover efforts. Their main goal is to make sure people are not illegally snagging fish. Some people feel the ODNR tends to be a bit too militant, however, I have never had anything but positive firsthand experiences. I will say it is a good idea if you walk by any trash or debris to pick it up, whether it was yours or not. This is a good sportsman quality to have at all times and is especially smart during the run. Overall, just follow the rules and you will not have a problem. Anything you deem questionable, error on the side of caution. 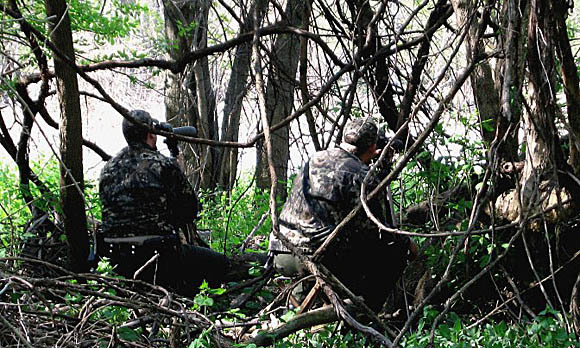 Lastly, consider calling the ODNR hotline if you observe illegal activity (1-800-POACHER), you can remain anonymous. There are a few stereotypes and misinformation that always seem to surface about the run that completely make me angry. One is that the fish aren’t biting and that they are all snagged. Simply put, this just isn’t true. When you fish for them, you will feel the strike often no different from a bass, and the obvious strike is verified when you net a fish that is clearly mouth hooked. At times you will inadvertently snag a fish, usually you can tell it is a snag and not a bite immediately. When this happens, just release the fish and no harm. I was motivated a few years ago to call the ODNR after reading on some of the fishing web communities people’s opinions and thoughts about the run. An Ohio DNR fish biologist from the Cleveland office was nice enough to give me about an hour of their time. Thank you Andy! The first question I asked was regarding a claim that the DNR had done a study that showed the fish aren’t biting. Needless to say, that was quickly discarded as non factual. The DNR has never done any study to quantify or qualify the way, reason, or any other aspect of the feeding of the ‘run’ fish. They just simply operate with the complete understanding the fish do bite and are legally taken, with the enforcement division actively seeking those anglers taking fish when this does not occur. We had a lengthy discussion over how the river fish were considered snagged by unethical angling riff raff yet the boaters fishing the same spawning fish in the lake was perceived as ‘sporting’. This leads right into the next aspect that we talked about concerning the run. Why is the run open to fishing at all if the fish are spawning? It was explained to me that the number of fish entering the rivers to spawn is only a very small portion of the total Walleye population. The Walleye entering into the river also have a much more statistically tough time to have a successful spawn verses the much larger population in the lake. This isn’t from angling pressure but rather the specific conditions needed in the river to make the spawn successful. Anyone familiar with NW Ohio weather knows how often our weather is sporadic and inconsistent. The proposed data expressed in the phone call was that even with perfect conditions in the river, that successful spawn would likely represent 15% or less of the total Walleye population. More commonly the river fish represent 4 to 8% of the total population. If anything, to me, this would indicate closer regulations for the lake fish as they make up the larger portion of the fish population and also are more likely to successfully spawn. I am playing ‘devil’s advocate’ of course, and I do think the river fish should also have some regulation to be assured they are successful enough to keep creating a fresh crop of fish that will return. Overall, the argument really shoudn’t be over the run it should be whether people believe in fishing during the spawn at all. The debate over that is something well-known to bass fisherman and will always be going on, it surely won’t be decided anytime soon, especially on a small site like this. If this isn’t spam, thank you. Went up about 6 yrs ago. Said never again. Been going back every year since. 🙂 You are spot on here. Great time and nice people in the river, for the most part. Never had any issues. Thanks for compliment that I have accurately described the Walleye Run. I moved from NW Ohio to NE Ohio and don’t make it every year anymore, I miss it terribly. At least I am closer to the bulk of the Steelhead now. The Walleye Run brings a lot of people from a lot of various backgrounds together in search one common goal, WALLEYE! I hope you do well this year man. Was in fremont-sandusky River caught a limit took two to w.va. For Easter my brothers and i really enjoyed them. Has the walleyes stared running yet? ?? I would say the mild temps will make everything on an earlier timeline this year. The Maumee Tackle Blog is your best bet for latest info. Sorry I missed this question, I imagine things are winding down by now. Any trip of considerable distance to fish has risk as to how conditions will be and whether the fish will be biting… but overall if you monitor the sites and call the tackle shops you will get largely trustworthy information.